A prestigious international award will allow a University of New Brunswick student to study a remote impact crater in Canada’s Far North that has remained unexplored by science for 50 years. Maree McGregor, a graduate student in earth sciences with UNB’s Planetary and Space Science Centre, will be heading to the Nicholson Lake impact crater, located about 600 kilometres east of Yellowknife in the Northwest Territories. “Nobody has studied it before – not with advanced technologies. It is really exciting to be able to carry out field work on this little-explored crater in such a remote part of the Canadian wilderness,” says Ms. McGregor, a native of Perth, Australia, who came to UNB for a chance to study at the renowned Planetary and Space Science Centre. What makes it possible is the support she will receive through her receipt of the 2017 Shoemaker Impact Cratering Award from the Geological Society of America’s Division of Planetary Geology. The international award honours the memory of Eugene M. Shoemaker (1928-1997), one of the founders of the science of impact cratering who brought geological principles into the emerging discipline of planetary science. “Maree is an incredibly dedicated and passionate researcher so it is no surprise to us that she has received such recognition. We’re very proud of her,” says Dr. John Spray, her supervisor and the director of the Planetary and Space Science Centre, located on UNB’s Fredericton campus. When she makes the journey next summer, she will be visiting the site of an asteroid strike that took place 389 million years ago. She knows its age because she helped pinpoint the date through advanced testing techniques employed at UNB as she prepares to undertake her PhD thesis on the crater. And now she hopes to discover much more about Nicholson, a roughly circular crater about 12 kilometres in diameter now covered by water. By studying impact craters, researchers uncover insights into our solar system and interactions between its planetary bodies. “Being able to date impact craters on Earth will help us understand how asteroids interact with planetary bodies such as the Earth, Mars and the moon. It gives us an idea of how often asteroids will hit our planet and may help us mitigate future asteroid strikes,” says Ms. McGregor, who has been fascinated with space and with geology since childhood. 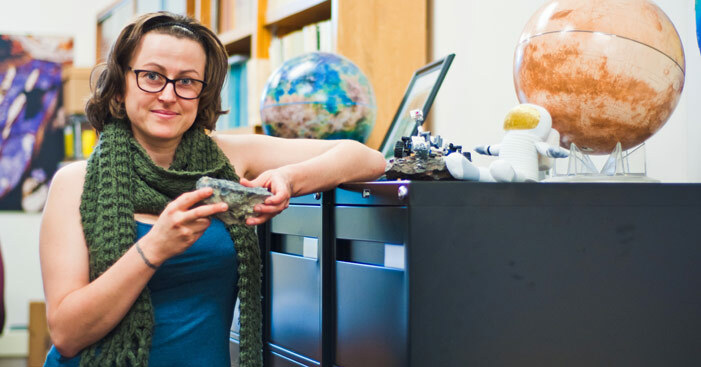 Ms. McGregor is the 19th recipient of the Shoemaker Impact Cratering Award, and the third awardee from the Planetary and Space Science Centre at UNB. The centre is one of the larger impact cratering research groups in the world, and draws students and researchers from around the globe. Photo: Maree McGregor, a graduate student in earth sciences with UNB’s Planetary and Space Science Centre, is the 2017 recipient of a prestigious international award, the Shoemaker Impact Cratering Award.